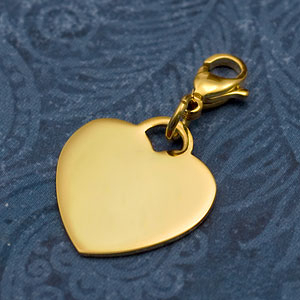 This Gold Plated Stainless Steel Heart Charm can be engraved on front and back with a symbol or message. Attach to a favorite bracelet - lobster clasp opens up to 2mm wide. If you choose a symbol do not combine with text on same side due to space. Plating is 18K gold. Please use a soft cloth without chemicals to clean gold plated jewelry.